To da loos: Crazy about tufted furniture? Then you'll love this tub base. Crazy about tufted furniture? 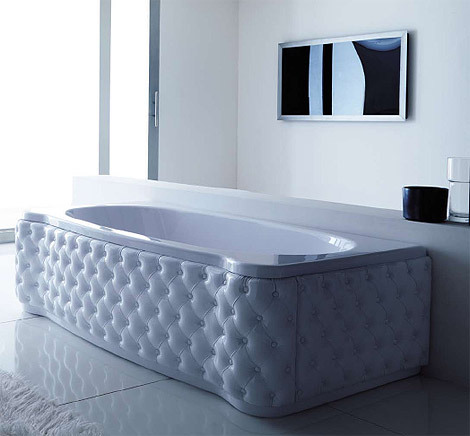 Then you'll love this tub base. tufted design is perfect for a diva's bathroom. To really turn this bathroom into the ultimate diva boudoir I'd add a mirrored makeup table covered in silver trays with ornate perfume bottles and a vase of white roses, a clear pink ghost chair draped with a silk robe, feather slippers & a beautiful ornate full length venetian mirror.